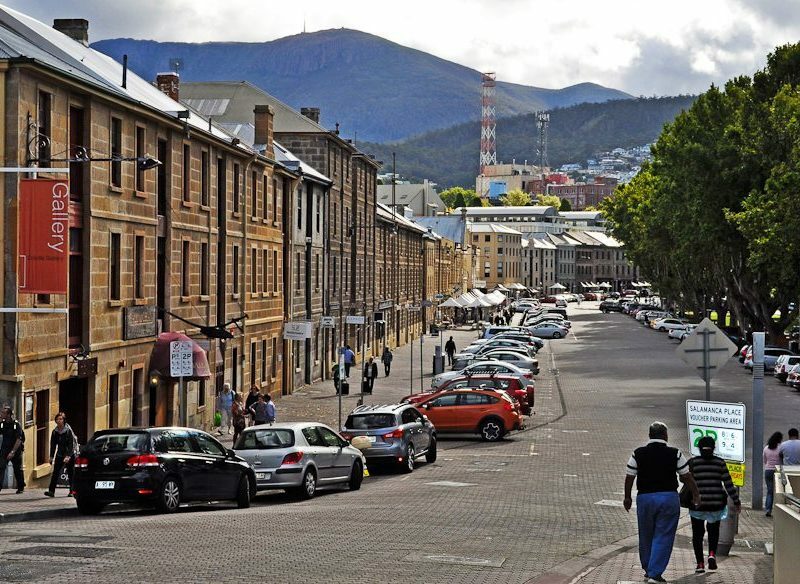 Follow us: There's an art to finding the best art in Hobart's Salamanca Place. 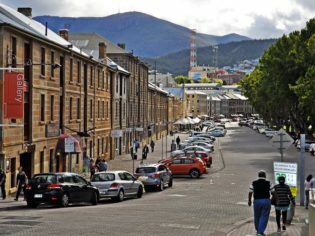 Nestled in the foothills of Battery Point between Hobart city and Sullivan’s Cove lies a strip of nearly 200-year-old sandstone warehousing with a chequered past. Constructed by convicts during the whaling boom of the early nineteenth-century for local merchants, these warehouses stored whale oil, grain, wood, apples and, later, the odd brothel and several inns attracting wild characters and salty sailors. These days, while the famous Salamanca Market attracts thousands of tourists each Saturday, every other day offers a more relaxed pace, allowing visitors to peruse every corner of the historic arts and crafts precinct. And, as Kristie Hayden discovers, it’s a thoroughly modern shopping experience contrasting beautifully with the preserved Georgian façade of Salamanca Place and the dark cloisters of renowned Salamanca Arts Centre. Here are the 10 places you simply have to browse (in no particular order and take your sweet time). While Tasmanian designer Leonie Struthers makes magic upstairs in her studio, her ground-floor retail space in Salamanca Arts Centre is where she’s willing to share it. Clothing labels LJ Struthers and LJ Junior showcase natural Japanese fabrics, such as linen, cotton and silk, in structured yet flowing designs, all sewn by local artisans. The Maker brand home-wares plus local jewellery designers’ pieces are also featured. But the real treat here is the eclectic mix of Japanese treasures that Struthers collects, her eye for quirky and delightful impeccable. Balsa wood animals (possibly the happiest wooden animals in the world), vintage Japanese books and wall maps are all take-home treasures. Since 1978, Aspect Design has supported Tasmanian artists, using local materials; one of the state’s original local-made galleries. From porcelain to fine glasswork, the collection exudes the quality and proficiency you would expect from 90 handpicked Tasmanian artists. Hot glass artist Peter Rix creates the most divine little glass animals and objects from penguin families, tiny fish, apples and mushrooms. From the plethora of other makers, there are handcrafted wooden chopping boards, coasters, ceramics, and beautiful wooden chests. Even whole dining suites. Blink and you’ll miss it, this tiny red-ceilinged artisan studio jeweller is a real gem (pardon the pun). Using traditional goldsmith methods coupled with genius Phil Mason’s creative twist, each piece is utterly unique in its marriage of contemporary appeal to vintage style. Phil works intuitively by hand and eye, forming and soldering each piece with master precision. You could spend hundreds or thousands on anything from Flinders Island topaz to Mason’s signature solitaire diamond depending on your taste and depth of pocket. Son, Tyrus, also lends his motifs and skill to the collection, largely influenced by his love of skateboarding which he has translated into avant-garde contemporary rings. Go on, admit it. Your school days were fraught with frustration – despite your best efforts during drama, you never transformed into the fairy you always knew you could be. Frown no longer – Faerie (and Pixie) school is here! Children are transported into the realm of magic where, by a sprinkling of dust, wishes can come true. Prince and princess crowns are made during art lessons and dream-catchers probed in science class. Assistant fairies host birthday parties, tea parties and help keep the shop filled to the brim with a colourful array of fairy paraphernalia. Located in vibrant Salamanca Square. Located in vibrant Salamanca Square (behind Salamanca Place), this independent bookshop is overflowing with quality reads and is a dynamic part of the local literary community. You could spend hours perusing the titles at The Hobart Bookshop. For visitors looking for quintessentially Tasmanian keepsakes, there’s a fabulous selection of convict reads and interesting Van Diemen’s Land histories. Contemporary novels, cookbooks and biographies are well represented but it’s the second hand section, stocking a goldmine of rare and old Tasmanian books, which gives this place its unique appeal. Spacebar Gallery, Salamanca Place, Hobart. Jewellery and metal collective Hammer & Hand, Salamanca Place Hobart. Paul Cruttenden’s limited-edition framed surfboards at Gallery Salamanca. Just entering this Australian contemporary art and design gallery is a colourful feast for the eyes. An exceptional display of Tasmania’s talented emerging artists sits among a well-established Australian contingent. From ceramics and jewellery to textiles and fine art, Gallery Salamanca provides a wonderful platform for local artists to communicate their varying passions. Artist Paul Cruttenden’s limited-edition framed surfboards are carved from exquisite, rare timbers exactly to scale. Grouped, mounted and framed, each artwork is its own history of surfing; precise, insightful and utterly beautiful viewing. Balsa wood animals: specialtys of The Maker, Salamanca Place, Hobart. Forget the plastic-fantastic, forget impossible instructions with questionable translations, and forget losing screws too small for human fingers. Help is nigh! Toys To Enjoy (by name and nature) provides the same delightful things you cherished as a child, toys you know how to build and use. With a background in fine arts and pottery, owner Loretta Olsen has an eye for artisan style and a taste for enduring quality. The compact shop is jam-packed with all manner of tin, wood and canvas. There are kaleidoscopes, metal wind-up clockwork toys, wooden sailboats, doll houses (a suburb’s worth), push-me-pull-me toys and hanging aeroplanes with spinning propellers. Free your inner child!